Unit of continuous operation "Oratorio-5" produced in NPO "Kvarts", Kaliningrad". This installation is intended for the deposition of high-conductivity protecting and other functional coatings onto large-scale products. The necessity for such an installation in NPK LUTS is dictated by production needs as well as by the fact that domestic industry does not produce serial magnetron-type installations for the treatment of products of required dimensions. "UNVP" is made on the same principle as the axial-symmetric diode magnetron. Coating is deposited onto a product surface in vacuum at sputtering of target (cathode) material with ions of the plasma produced in the magnetron-type discharge. pipe - inner diameter ranges from 0.3 m up to 0.7 m, length - 1.6 m.
Material of coating: Сu, Ti, TiN, stainless steel, etc. Coating thickness ranges from 0.1 up to 30 µm, thickness non-uniformity is no more than 10%. This installation serves for the deposition of functional coatings onto small-size products. It makes possible the deposition of Al, Co, Cr, Au, Ag, Ti, Ta - films and films of other nonmagnetic materials and their alloys . The magnetron-type discharge allows the plasmo-chemical synthesis of some compounds such as nitrides, oxides and carbides of some metals. The vacuum chamber of the installation is equipped with a planetary system for rotating substrates to ensure uniform coating deposition. Thickness of deposited coatings depends on the time of deposition and is varied from 0.01 µm up to tens of microns. Discharge power (the d.c. mode) is up to 5 kW. 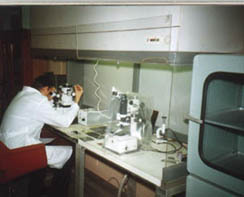 Deposition rate - 1 µm/min. Maximum sizes of products under treatment are: diameter - 200 mm, length - 150 mm. To measure the main parameters and to study properties of produced coatings, an express -laboratory has been organized as a part of the workcell for plasma deposition. For checking plasma composition in the process of deposition a "Spectrographic complex" was purchased. simultaneous deposition of coating onto whole surface of the treated product. replacing methods of coating deposition adversely affecting the environment. deposition of In-coating onto electron accelerator RF system components made from stainless steel, brass, carbon steel to ensure vacuum seal and RF-contact. The introduction of above processes allows one to have an appreciable improvement of quality of the most critical accelerator units and reduction of their production cost. In future, the spectrum of suggested coatings and range of products for which surface treatment we apply plasma technologies will steadily expand.